Bangalore’s BIG Bus network is bright, colorful, and saves city residents time and money. Photo by Benoit Colin/EMBARQ. In many parts of the world, the bus is suffering from a public image crisis. According to a report by the US Federal Transit Administration, many people already look down on public transport in general, and the bus in particular is often seen as slow, inconvenient, and uncomfortable. However, public transport systems that integrate multiple modes are essential for creating sustainable cities. Buses—often the primary public transport mode in emerging economies—play an indispensable role in making that a reality. How, then, can city leaders rebrand the bus as an attractive mobility option? As noted above, buses have developed a reputation for being inefficient, especially when compared to trains, metro systems, and light rail. However, the experiences of many cities globally confirm that buses and bus rapid transit (BRT) systems can be efficient at moving people, given that bus networks can operate within the existing built environment and don’t require massive construction projects or eat up valuable urban land. Bus stops can be implemented quickly, and are cheaper than other modes to install and maintain. This gives buses greater flexibility to respond to riders’ individual mobility needs. Physically, buses have also come a long way, and can offer high-quality service to riders. They can be comfortable, full of light, and are increasingly equipped with amenities like WiFi. The aesthetic and physical qualities of stations and boarding areas also have a significant influence on riders’ perceptions and transit behavior. Furthermore, some cities—like Bangalore, India—have embraced innovative color schemes to give their buses unique identities. Many metro lines have easy to remember names based on colors. Bus lines should consider adopting a similar naming pattern, and even using paint to make individual lines easily recognizable and easy to use. 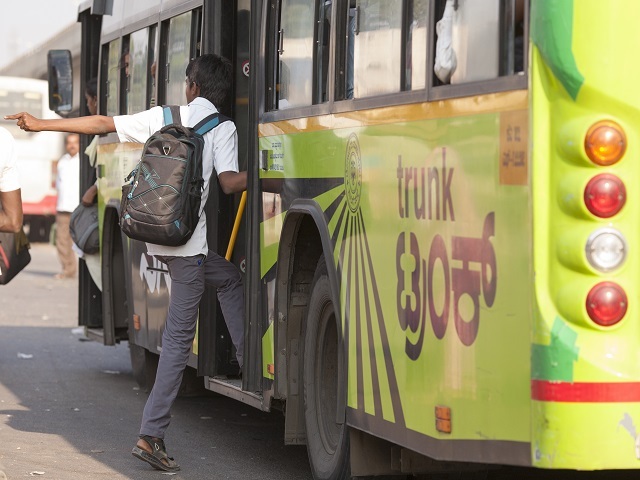 For example, the BIG Bus network in Bangalore uses green for buses that connect the center to the periphery, and blue for buses that connect you to the green lines, wherever you are. The case is strong for embracing buses as an effective, sustainable transport option, but unfortunately the bus’s public image has yet to experience a corresponding revitalization. That’s why marketing campaigns are invaluable for engaging the public and working to change common perceptions of the bus. A good marketing campaign should have three goals: acquire new users, retain existing users, and secure public support. Many past efforts have focused on attracting new users, and some cities, like Los Angeles, have been successful in marketing high frequency commuter buses to car owners. However, ensuring that existing users are happy with the service is equally important, as riders who are pleased with their quality of service will be more likely to act as natural advocates and recommend bus transport within their communities. The third goal of a marketing campaign—securing support from public leaders—is particularly critical, since elected officials often overlook buses for the shiny glamour of new rail lines. However, as a recent New York Times article argues, because a quality bus system is much cheaper to build than rail, the savings from choosing buses could be allocated to public relations campaigns, strengthening the image and ultimately the popularity of public transport. With over $9 billion spent annually on car advertisements, don’t energy efficient buses deserve some attention too? Transport leaders need to start prioritizing smart marketing tactics that will generate more interest in public transport. Rebranding the image of the bus doesn’t change it functionally, but it’s a crucial component in moving cities away from the traditional car-centric mentality. Research has shown that buses and BRT systems curb greenhouse gas emissions, cut down travel times, and reduce traffic fatalities and congestion. Cities that are sustainable in the long run can’t just offer buses as another transport alternative—they need to make them attractive too. To learn more about marketing and branding sustainable transport, check out EMBARQ’s From Here to There guide.